Use the device across the whole country so bring it with you as you travel around, you can even access Facebook and WhatsApp! use this wifi egg can login gmail and whatsapp in china! It's never been so easy to stay connected whilst abroad. 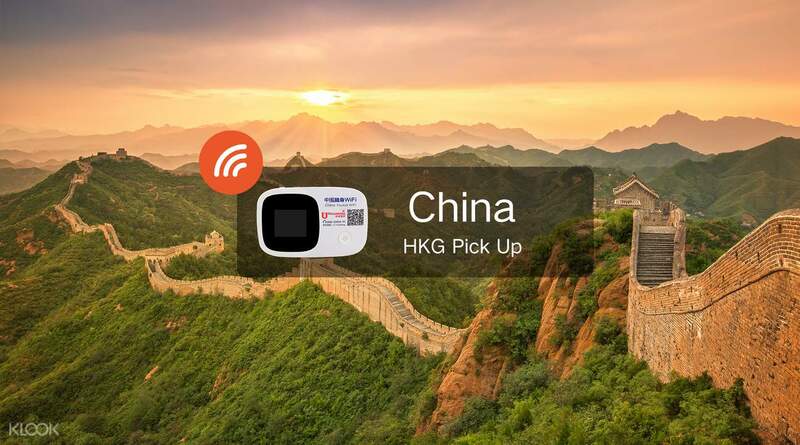 With an easy pick up and drop off service at Hong Kong International Airport you'll enjoy high speed WiFi access throughout your stay in China, without the stress of sourcing WiFi once you get there. The speedy 4G device connects up to five different phones, laptops and tablets at once and supports 4-6 hours of surfing on one battery charge. So add some spontaneity to your travels with the ability to plan on the go and keep in touch with friends and family wherever you are. If you arrive at the airport returns desk after 11:00pm, a drop box service is available. You will be returned your deposit to your bank account within working 7 days. It is quite convenient when you have a wifi device with you while traveling around Hong Kong and Macau! It is quite convenient when you have a wifi device with you while traveling around Hong Kong and Macau! I'm so pleased with this portable wifi. It saved me the hassle in China on getting a chip etc etc. It allowed me to travel with it and I could attach my 2 iPhones and a lap top with no problem at all. Hotel wifi cannot be relied on and this saved me time and connectability everywhere right up to boarding my plane! I'm so pleased with this portable wifi. It saved me the hassle in China on getting a chip etc etc. It allowed me to travel with it and I could attach my 2 iPhones and a lap top with no problem at all. Hotel wifi cannot be relied on and this saved me time and connectability everywhere right up to boarding my plane! Good service and response! We had problems on the pocket wifi after landing China. But, hotline referred me to Uroaming Whatsapp and Wechat support and problems resolved. Good service and response! We had problems on the pocket wifi after landing China. But, hotline referred me to Uroaming Whatsapp and Wechat support and problems resolved. The wi-fi worked really fine. I could access to facebook, google, whatsapp, etc which were prohibited through hotel's wi-fi. No stress. The wi-fi worked really fine. I could access to facebook, google, whatsapp, etc which were prohibited through hotel's wi-fi. No stress. Easy pick up and return at HK International Airport, easy to set up and and speedy wifi. Battery can be used for a whole day without charging. Easy pick up and return at HK International Airport, easy to set up and and speedy wifi. Battery can be used for a whole day without charging. Every good and conveient to get the WiFi pocket er at Mong Kok center. The battery is good too can be used over 8 hours. Speed of WiFi is excellent. Every good and conveient to get the WiFi pocket er at Mong Kok center. The battery is good too can be used over 8 hours. Speed of WiFi is excellent. Good wifi connection! It went slow till the end of the day, and sometimes no connection In crowded busy area. Good wifi connection! It went slow till the end of the day, and sometimes no connection In crowded busy area. The application process was very smooth and efficient. Pick-up and return point was convenient and easy to find. Excellent service at the counter, I would recommend Klook to anyone who need to travel. The only thing that they should improve is the cleanliness of the bag attached to the wifi egg, it was so dirty and smelly that I need to replace it with another pouch I have with me during my trip. Otherwise everything was positive. The application process was very smooth and efficient. Pick-up and return point was convenient and easy to find. Excellent service at the counter, I would recommend Klook to anyone who need to travel. The only thing that they should improve is the cleanliness of the bag attached to the wifi egg, it was so dirty and smelly that I need to replace it with another pouch I have with me during my trip. Otherwise everything was positive. This is a good experience to purchase this wifi egg. My trip was to China, the reception is good, the egg is handy to carry. The total package comes with a USB line and a plug in which is very friendly to use. I will probably come back to purchase in my future trips. This is a good experience to purchase this wifi egg. My trip was to China, the reception is good, the egg is handy to carry. The total package comes with a USB line and a plug in which is very friendly to use. I will probably come back to purchase in my future trips. Overall is good! Easy access and good work order! Long life battery can operate up to whole day! Overall is good! Easy access and good work order! Long life battery can operate up to whole day!